Claire has been doing spelling since the start of this year - are there specific methods to learn to spell? 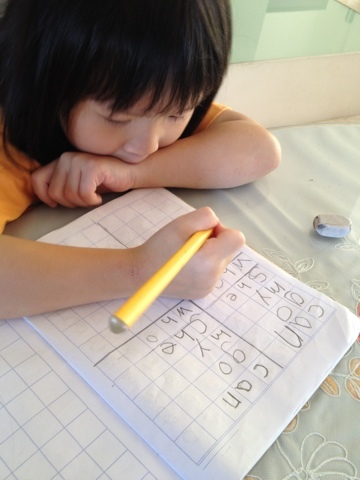 I teach her to recite the letters and then the word as she writes them so that they 'register' in her brain. Is this a good method? I always know its trouble - when the OTHER family falls ill. Though we do not meet often (once every two weeks, maybe - even that is too much), there is a 'carrier' who will bring the germs and viruses over to my household. It normally starts with the children and then DH... and I'm usually the last to get hit. But since I am pregnant now (there are many articles explaining why pregnant women get sick more easily - just google it), I got infected before DH and I'm glad to say *touch wood* that the children got a much milder version. Recently, there has been a furore among parents with young children over plans by the education ministry to 'review' the current primary school registration process as the current system gives priority to certain groups of people, much to the chagrin of others. Just for the record, Chace at 30 months, only has 19 teeth and is still not potty trained. I'm a believer that the child will achieve a milestone when he/she is ready and thus I'm not worried. The grandmas, on the other hand, have been bugging me to toilet train him particularly because Claire was off diapers in the day when she was about 18 months. However, he is way before schedule for other milestones e.g. speech and motor skills so that, in itself, really isn't a cause for concern.